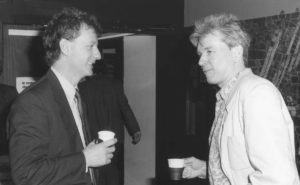 In 1990 I invited Dr Jeremy Leggett (on the left; I’m on the right) to give a lecture on climate change at Glasgow University. This photo was taken just before his talk. We had to relocate to the main Science building lecture theatre to accommodate the hundreds of students and staff who wanted to hear him. The UK fracking industry claimed last week that it is being strangled at birth by unreasonably severe rules on earthquake monitoring during fracking. It has enlisted the support of nearly fifty geoscientists who assert, in a letter to The Times, that the government’s limit on the permitted size of earth tremors, currently constraining the frackers’ ability to operate, is set too low. The signatories describe themselves as “practising geoscientists working in UK universities and institutions”, giving an impression of independent expertise. But as Channel 4 showed in an investigation last week, many of them have oil industry connections, and depend upon oil-industry funding for their research. As geoscientists who worked beside several of the signatories when we were university academics in earlier phases of our lives, and having ourselves at times been funded by, or consulted for, the oil industry, we have three points to contribute. First, and most important, is the incomprehensible omission of climate change. It is astonishing that fifty-odd British geoscientists – whose scientific training means they fully understand the science of climate change – can declare, without qualification: “we recognise the potential existence of a nationally valuable and exploitable shale gas resource, and support its development”, while simultaneously many thousands of anguished schoolchildren are taking to the streets worldwide, pleading for a viable future in the face of the climate threat. The climate scientists of the UN’s Intergovernmental Panel on Climate Change (IPCC) tell us we must decarbonise energy within just a few decades if we want to have a reasonable chance of hitting the global-heating targets in the Paris Agreement on climate change – which every government on the planet adopted. The UN Secretary General tells us that not to attempt this is “immoral and suicidal”. The evidence that shale fracking in the USA is accelerating the build-up of methane, a potent global heating gas, is voluminous; it appears to be leaking at many points in the shale gas and oil production process, and at many sites. Quite apart from the carbon dioxide that is added to the atmosphere from any shale gas produced and burned, this is a terrible problem, given the warnings of the IPCC’s climate scientists. Secondly, are these industry-funded geoscientists genuinely independent of industry? The Channel 4 News item quoted them as saying: “Any implication that our judgment is impaired in any way by any connection we may have or have had with the oil and gas industry is shameful, ignorant and insulting … We are driven by science, and by science alone“. As geoscientists who once worked in their world, we have seen first-hand how the oil industry’s needs and purse strings pervade university geoscience departments. We find the claims of independence unconvincing. The letter signatories call for the government “to commission an expert review” of earth tremor controls on fracking. But in a statement that somewhat undermines their claims of independence, they also told Channel 4 News “you’d be hard pressed to find a geoscientist anywhere in the UK who hasn’t had, at some point, some connection with the oil and gas industry.” So who would conduct this expert review? By the geoscientists’ own admission, the government would have little choice but to choose poachers as gamekeepers. Far better to begin with the end in mind. We must decarbonise our world. We cannot do that while permitting new gas production. The fact that so many British geoscientists do not even mention this inconvenient fact is a clear indication of how servile they have become in their dependency on oil-and-gas largesse. It is not only a betrayal of earth science, but also a betrayal of the striking schoolchildren who will suffer if the world does not decarbonise. Lastly, the induced earth-tremor problem is far from trivial. One only has to go to the Netherlands to see how gas production at an industrial scale – as the frackers intend in rural England – can create devastation at the surface. Above the Groningen gas field – where fracking isn’t even necessary to produce gas – damage to properties through subsidence and tremors has led to the Dutch government greatly curtailing the oil industry’s operations, and setting an end date for all drilling. The industry long maintained that there was no significant danger: in our experience, it always does, for as long as it can get away with it, whenever its core operations are threatened. We two geoscientists wish to squarely disassociate ourselves from our former colleagues. And let us be more honest about our motivations than they were; we are active opponents of fracking, on sound evidence-based science, and active supporters of solar and other renewable forms of energy. That is because we are as frightened about climate change as are the school students. Jeremy Leggett was a Reader at the Royal School of Mines, Imperial College (1978-89), and is now founding director of Solarcentury. David Smythe was Professor of Geophysics at Glasgow University (1988-98), and remains an active researcher. Both have won awards for their geoscience research.